Wi-Fi smart plugs provide a wonderfully easy way to add connectivity and smart home controls to your old “dumb” devices, but so many people overpay for them. Seriously, why would you pay $25 or $30 for a big brand name when you can get the exact same thing at a fraction of the price? 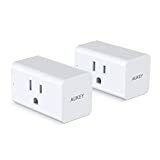 Check out Amazon’s current sale on AUKEY Wi-Fi Smart Plug 2-Packs. They normally retail for $28, which is already a great deal. Use the coupon code MXMAS5AK at checkout though, and you’ll only pay $19.99!